If there is one place I keep popping along to lately it seems to be St Michael’s Mount. 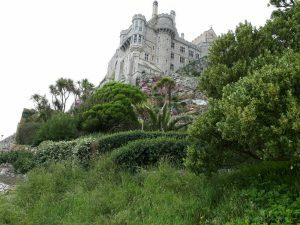 The Lost Gardens of Heligan and Tintagel Castle are also very popular. Nearly everyone wants to see St Michael’s Mount. It is one of the absolute iconic sites in Cornwall and maybe the whole of the UK. People are drawn to it from all over the world on a modern day pilgrimage. When the tide is out they drift across the causeway to the island, in an almost trance like fashion. The causeway appears as the tide rolls back and then there seems to be no other option but to cross over to the island. 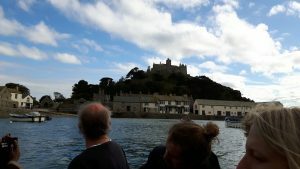 Because of the tidal movement St Michael’s Mount is sometimes only accessible by boat. The ferry-man asks for £2 each way. In this case you should definitely pay the ferry-man and the price is already fixed! 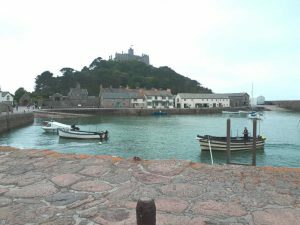 The bonus is that the island is much quieter when the tide has cut off the island from its mainland village of Marazion. It’s also worth checking opening times for the house and for the gardens. The house is always closed on Saturdays and the gardens are only open on some days at certain times of the year. I visited the beautiful gardens this year for the first time. 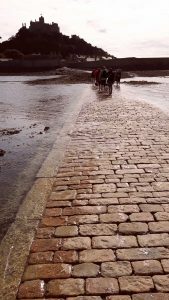 It’s possible that St Michael’s Mount is ‘Ictis’, an island referred to in writing from the 4th Century BC. It would have been known of because of the Cornish tin trade. Marazion means market town in Cornish. At this time the natives were described as friendly due to their regular contact with outsiders – much like today. It’s certain that thousands of years ago Mount’s Bay was above sea-level and trees grew on and around what is now a tidal island. These tree-stumps are occasionally exposed during storms and low tides. Fast forward in time and St Michael’s Mount changed hands from English to French ownership and back again, perhaps given away before 1066, by Edward the Confessor and then reclaimed by Henry V.
The building on the island was a monastery, it was then fortified as a castle and it is now a family home. 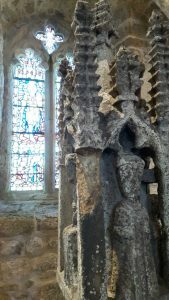 There is a story that the bones of a medieval anchorite of extraordinary height, were discovered and re-interred on the island. During the English Civil War it was garrisoned by the loyal Bassett family, and held out for the king. The St Aubyn family became owners after this time. That’s just some of the history. But if you want some romance and magic, it’s also claimed to have energetic earth ley-lines pulsing through its’ core. Much has been written about the St Michael line, a mystical ‘energy field’ known as a ley-line, which runs across England from Land’s End to Bury St Edmunds. Along the way St Michael chapels mark many of the high places. Suffice to say that St Michael’s Mount is on the route and more than one key ley-line is said to pass through. There are hot spots, vortex fields and thrills – for those who believe! 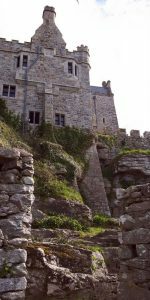 St Michael’s Mount is now owned by the National Trust. Free entry is available to National Trust members – don’t forget your card. 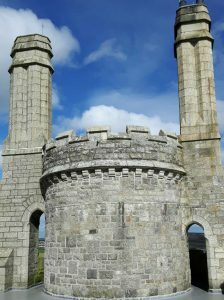 If you would like to visit there with me, I offer a tour as part of Penzance and The Far West of Cornwall. It depends upon your preferences as to whether we stop for a quick photo opportunity and move on to other things, or spend a few hours there. Please contact me if you would like to book.